Gogo gets thumbs up for speedy in-flight broadband in the U.S.
In-flight broadband provider Gogo's 2Ku technology has been approved by the Federal Aviation Administration, opening the door for data speeds up to 70Mbps. The company plans to launch commercial services this year. Clearing this regulatory hurdle was an important step for Gogo. 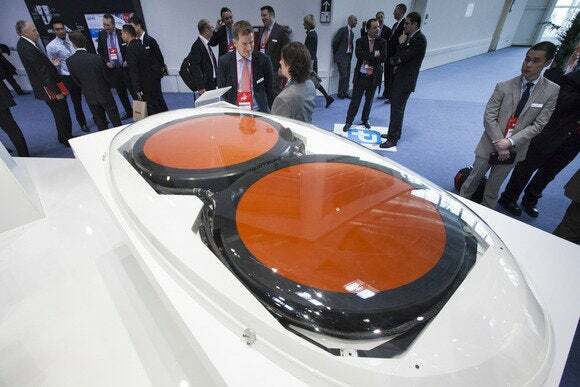 The company has received the final so-called Supplemental Type Certificate from the FAA, which it required in order to launch the next-generation technology. Seven commercial airlines have signed up for either a trial or fleet deployment of 2Ku, covering more than 500 commercial aircraft, Gogo said without giving names. The aircraft will be upgraded next year. The 70Mbps that 2Ku can deliver is a big improvement over the 3.1Mbps Gogo was able to offer when it got started about five years ago. The higher speeds are achieved through the use of two antennas: one for the link to the aircraft and the other for the return link to the ground, according to Gogo. The new system is cheaper to install and run, said GoGo, meaning airlines could afford to put it on more planes. Capacity is shared between all users on the same aircraft, so the actual data speeds users experience will depend on what other passengers are streaming or downloading. Today GoGo offers connectivity on Air Canada, Alaska Airlines, American Airlines, Delta, United and Virgin America flights. Data plans include a 24-hour pass at $16 and an unlimited monthly pass at $59.95.